The new wraparound portion of the PGA Tour FedEx Cup schedule came to a completion this past Sunday at the OHL Classic at Mayakoba. Harris English capped off the new fall FedEx Series with a victory, and as such climbed to second on the latest standings heading into 2014. English is just 27 points behind Jimmy Walker for the top spot. The next FedEx Cup event will be held in the second week of January 2014 in Hawaii for the Hyundai Tournament of Champions. In total, we’d have to say that the new FedEx tournament additions to the season were a success. The fields were noticeably stronger and garnered more interest from players and fans alike. That was the goal after all. In year’s past, people seemed to forget about golf from October through December. 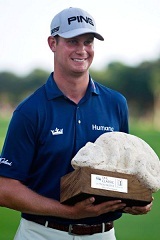 But while the FedEx Cup events are done for 2013, there will still be some other noteworthy events taking place. The World Cup of Golf gets underway this week. There is also the Northwestern Mutual World Challenge hosted by Tiger Woods which produces a field of the top players from around the world. And while these don’t count towards official PGA Tour wins, they produced high-quality golf with strong fields. Those players who took advantage of the FedEx Cup events in the fall season will have a big advantage come 2014. Walker has 684 points, which is a heck of a start. Tiger Woods didn’t play in any of the fall series events, and as such will start 684 points behind Walker when it comes time for him to tee it up. That schedule has done Woods just fine in the past though. Who this really helps are the players like walker and English who are on the cusp of trying to get into these FedEx Cup playoff events through the Tour Championship. There were a ton of points up for grabs and the players who participated give themselves the best chance to go into 2014 and try to generate some momentum. This entry was posted in News, Opinion and tagged 2013 fedex cup season, 2014 fedex cup season, 2014 pga tour season, pga tour on November 18, 2013 by Bryan.